« VOX: Scientists added human brain genes to monkeys. Yes, it’s as scary as it sounds. Exodus 25 introduces instructions for the Ark of the Covenant and Mercy Seat. What do they represent? What about the tabernacle and showbread? Might the Ark of the Covenant exist? Could the Ark be in Ethiopia? What about Hitler’s SS troops? Could Jeremiah the prophet have brought it to Ireland? 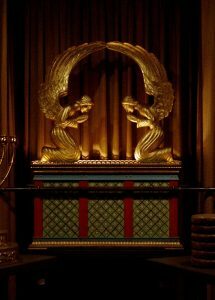 Was there a fulfilled dream related to the Ark of the Covenant? Do Jews, Catholics, or Musims have traditions about finding the Ark? What might Josiah have done with it? Could the Ark of the Covenant be in Israel? Might the Ark be below Mount Moriah or Mount Zion? What about Ron Wyatt’s claims from 1982? What are some spiritual ramifications of the Ark of the Covenant? Is mercy only for Christians? Will mercy be offered to others? This is the ninth sermon in a multi-part series intended to cover the entire Book of Exodus. In this part, Dr. Thiel covers every verse in Exodus 25 and addresses many questions and concerns. Here is a link to the sermon: Exodus 25: Ark of the Covenant and the Mercy Seat. EXODUS Exodus sermons include Exodus 1-4: Jewish Myths or Lessons for Christians Today?, Exodus 5-7: Serpents, Blood, and Revelation, Exodus 8-9: Plagues and Prophecy, Exodus 10-12: The Last Plagues & 21st Century Prophecies, and Exodus 13-15: Passover Protection and Armageddon. There is also more, such as the article: When was the Exodus? Did it Happen? Some deny the biblical account of the Exodus. Was Ramses II the pharaoh then? When did the Exodus occur? Is there proof outside of the Bible that there was an Exodus? Here is a related article in the Spanish language: ¿Cuándo fue el Éxodo? ¿Ocurrió realmente? Also: Reasons, Proofs, and Ramifications of the Ten Plagues of Exodus What do you know about these plagues? What happened to the ‘gods of Egypt’? Is there any confirmation outside the Bible? Might something worse be coming? A related two-part sermon is available: Egypt and the Plagues (Part 1) and Exodus Plagues and Prophecy (Part 2). Also: Exodus and the Days of Unleavened Bread This article discusses parts of the Book of Exodus with some connections to the Days of Unleavened Bread. Related sermons are available Exodus 1-4: Jewish Myths or Lessons for Christians Today?, Exodus 5-7: Serpents, Blood, and Revelation, Exodus 8-9: Plagues and Prophecy and Unleavened Bread: Lessons in Exodus. Another sermon is Exodus, Judgments, and Jesus. Also Exodus 4:24, Why would God have sought to kill Moses? What did Moses do wrong? Do you have a similar problem? Another article is Exodus 16-19 which covers all of those verses–here is a link to a related sermon: Exodus 16-19: Manna, Governance, and End Time Protection. Another article is Exodus 20 which covers all of the verses in that chapter–here is a link to a related sermon: Exodus 20: The Ten Commandments. Another article covers the verses in those chapters Exodus 21-24: These are the Judgments–here is a link to a related sermon: Exodus 21-24: Judgments. This entry was posted on Saturday, April 13th, 2019 at 12:01 am	and is filed under COG News, Old Testament History, Religious News.